VENUE: Poppa Rollo's Pizza, 703. N.
Valley Mills Dr., Waco. Mtg. Through retail interventions, corporate exorcisms, and some good old-fashioned preaching, Reverend Billy reminds us that we have lost the true meaning of Christmas. 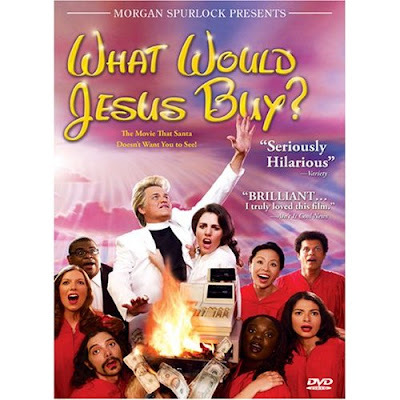 What Would Jesus Buy? is a journey into the heart of America from exorcising the demons at the Wal-Mart headquarters to taking over the center stage at the Mall of America and then ultimately heading to the Promised Land ... Disneyland. "Genuine and meaningful provocateurs like Talen are vital, and his message is a glad one to anyone who abhors the WalMart-ification of America." --Paul Kosidowski, Milwaukee Journal Sentinel. I think you will find this film funny and thought provoking. Please join us for food, film, and discussion, while contributing to local food banks for the needy. The Waco Friends of Peace are honored to have workers from the World Hunger Relief project near Waco attend many of our events. The fascinating essay below was written by one of Relief's members PETER ZYLSTRA-MOORE. One of the defining myths of the Republican Party is the concept of fiscal conservatism, as opposed to the so-called, “tax and spend liberals.” With economic concerns rising to the top among voters it is important to separate myth from reality. It is important to look at different factors including, overall growth, the national deficit, income growth of the rich and poor, and taxation rates and policy. If we consider some actual numbers from 1948 to 2005, a common measure of economic growth, Real per capita GNP, grew significantly faster under the Democrats. During their 26 years of office, after accounting for inflation, GNP grew an average of 2.78% per year. Under 32 years of Republican administration, real GDP grew an average of 1.64% annually, over whole percentage point lower than Democrats. In other words, our economy grew 2/5 more quickly under the Democrats. Not only has economic growth actually been slower with the Republicans, but they have also significantly increased the deficit. In fact the national deficit has increased 36.4% or 2.25% per year, in Republican administrations since 1978. The Democrats, on the other hand, have increased the deficit a total of 4.2%, or.35%, per year in office. We have spiraled into debt seven times quicker with the Republicans. Per year in office, government spending rose .76% under the Republicans, while it grew .83% per year under the Democrats. Government spending has grown only .07of a percent faster under the Democrats. The reason for this slight difference in spending is because Democratic administrations have made payments on the deficit rather than taken out substantially higher debt. It should also be recognized that one of the main reasons for a growing deficit is the fact that both Republican and Democratic budgets include irrationally high spending on the military. In considering the economic effects of each political party it is important to also consider the distribution of wealth. Princeton Professor, Larry Bartel did a mass study of political parties and their effects on economic growth for various groups in American society. He found that after accounting for inflation, the era of Roosevelt’s New Deal policies which began in response to the Great Depression not only provided the most economic growth overall but also the most equitable growth. Starting with Reagan, the income gap between rich and poor in the United States has increased with every Republican administration. Including Roosevelt, the gap between the rich and the poor has declined slightly with all Democratic administrations except under Carter who was hurt by oil inflation. According to Bartel, during Democratic administrations, Real Incomes (the amount you can buy with each dollar) grew twice as fast for middle-class families and six times as fast for working-poor families than with Republicans in office. It is fascinating to note that even the richest 5% grow quicker under Democrats (2.12% compared to 1.9%). Thus even if we don’t care about the poor we should vote Democrat. If we look back on history if we vote Republican for economic reasons, then it is because we want inequality, stunted growth, and deficits. Examining what has actually happened under each administration, we recognize that with Republicans our national debt has increased along with the disparity between rich and poor. At the same time their overall tax revenues have been equal to those of Democratic administrations. Finally per capita income has slid under Republicans. With Republicans, tax cuts for the poor and middle class which create consumption and equality are replaced with tax cuts for the rich and business, which leads to increased indebtedness and more frequent recessions. Even growth for the rich slows, because they can only produce profitably in relation to what is demanded. When we separate rhetoric from reality, it becomes clear; if we really want a government that will grow our economy and balance the budget, we had better vote Democrat. It is time for the Democrats, but not the Democrats of the past 30 years who look more and more like the Republicans. It is time for labor. It is time for unions. It is time to accelerate progressive taxation. It is time for big businesses to start paying taxes again and to start paying workers again. It is time for higher minimum wages. It is time for estate taxes. It is not about giving the poor handouts, but allowing the poor and middle class to compete. It is time for the Fed to be run not by big banks and their friends, but by democratically elected governments. It is time to improve rather than undercut our public education. It is time for an efficient single-payer medical system. It is time to create new, high-paying jobs; green jobs in producing renewable electricity and making our homes and businesses more efficient, infrastructure jobs to maintain and repair our country. It is time to focus our technology not on the military but on things that actually improve our lives and the lives of our children. It is time for the Democrats and it is time to demand of the Democrats a new New Deal. 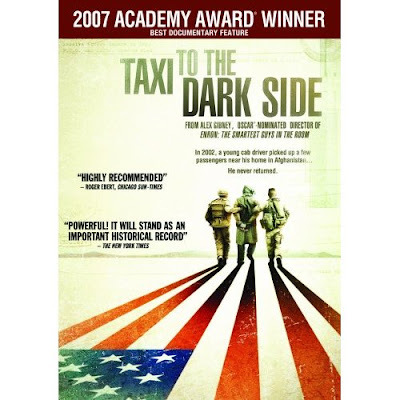 On Thursday, November 13, the Waco Friends Of Peace will present the Waco debut of the academy award winning film (Best Documentary Feature of 2007) Taxi To The Dark Side. This film, by Alex Gibney and Eva Orner, uses the death of an Afghan taxi driver while in U.S. military custody as a springboard to examine the role of torture in America's so-called "war on terror." We know that the mood on November 13 is going to be greatly affected (to say the least!) by the results of the election on November 4, but we believe that our chosen film will be relevant regardless of the outcome. Also, we hope to see many FOPs at Poppa Rollo's in order to celebrate or commiserate, as the case may be. There are those, their numbers shrinking every day, who would agree we have to "work the dark side." Growing numbers of us are yearning for the light. This movie does not describe the America I learned about in civics class, or think of when I pledge allegiance to the flag. Yet I know I will get the usual e-mails accusing me of partisanship, bias, only telling one side, etc. What is the other side? See this movie, and you tell me. The place is Poppa Rollo's. The time is the usual: 6:00 pm, with pizza buffet followed by the movie and discussion. Hope to see you there! --Harrison Ward, moderator. (for new attendees, Poppa Rollo's meeting room is at 703 N. Valley Mills Drive in Waco. Admission is free as always and donations are accepted. Everyone welcome).